Congratulations, to American Bullion for receiving “The Best Of Trustlink, 2016” Award in the category of Gold, Silver and Precious Metals. A minimum rating of 4.5 stars, based entirely on customer voting, is required to qualify for consideration of this award. American Bullion’s unblemished 5 star rating allowed them to easily rise to the top of the industry in the eyes of customers. American Bullion converts millions of investment dollars into physical precious metals ownership, on a monthly basis. 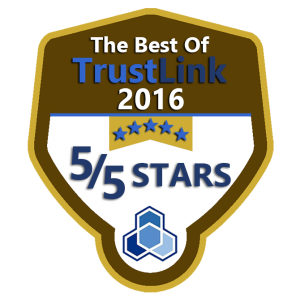 TrustLink was founded by the Better Business Bureau in 2008, in order to provide a forum for consumer complaints and compliments. In order to receive the “TrustLink Verified Review” label, the customer who writes the review must be engaged in a business transaction with the company being reviewed. The label is only provided if TrustLink can verify that the reviewer’s experience actually took place. Markets are reaching all-time highs under very questionable circumstances, the list of countries adopting negative interest rates continues to grow, and the Fed is getting ready for another round with the fiat printing press, so it’s good to know that there’s a company out there that can provide good honest service and value as we approach what promises to be a high demand period for physical precious metals.